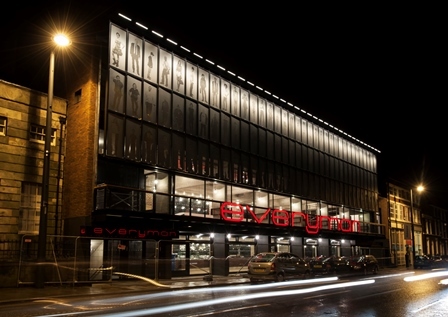 We went to the last night of ‘Twelfth Night’ on Saturday at the new, or rather completely rebuilt, Everyman Theatre in Liverpool. It was tremendous entertainment with songs and dance, Shakespearean comedy with a Scouse accent and an exciting start with Viola and the captain of the wrecked ship surging, dripping wet, onto the stage from what looked like a broken mirror lying on the floor but turned out to be a pool of water. Especially exciting for those sitting in the front row, since the Everyman is a theatre in the round and the front row probably got wet! They certainly had stage hands mopping up around their feet at the end of the scene. I was amazed at the interval to see people on their smart phones and tablets. Maybe they were communicating their excitement about the production on social media but perhaps more likely they were desperate to find out what had been going on in the world and who had sent them messages. For me, time ‘off the grid’, disconnected from the electronic world is precious and to be protected but many people find it hard to disconnect and appear addicted. Our gadgets pander to our tendencies to be workaholics and to socialize. Dr R. Thara, Director of the Schizophrenia Research Foundation in an interview reported in a piece by T.M. Luhrmann entitled ‘A great depression?’ in the NYT on March 25th, 2014 said “Gadgets. All these gadgets. Nobody thinks for themselves anymore.” We are certainly at risk of having no time to think for ourselves but the risk from our gadgets is more insidious because access to everyone else’s life via social media and professional networks can end up making our own life look dull and potentially depressing. Of course, most of us conspire in creating this false image by only telling the world about the good things that are happening in our lives. It is better to pick up a good novel if we want to relax and find out more about ourselves. see my post entitled ‘Reading Offline’ on March 19th, 2014. This entry was posted in Soapbox and tagged art, gadget stress, slowness, uncertainty on April 9, 2014 by Eann Patterson.